Is Having Fun at Work Important? According to the 2012 Great New Zealand Employment Survey, yes it absolutely is! According to the survey, 50 per cent of employees list having “fun and working with great people” as the most important factor in their employment. A fun workplace, among other things, is often highly correlated with engagement. 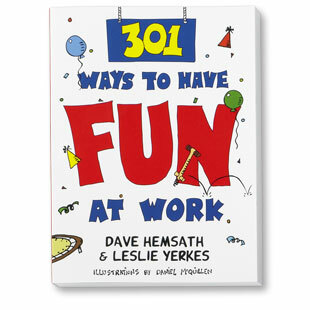 Since 2001 we have included the statement "Senior management encourages employees to have fun at work" in most of the employee surveys that we've conducted for our clients. In our annual norms study 2012 results, 62% of employees in the US believe that it's important for management to foster a fun work environment and that number is pretty much the same across most industries. When it comes to asking how well their companies live up to this goal, however, the numbers are much more variable from industry to industry, and unfortunately for fun-loving employees, quite a bit lower. As might be expected in a customer-service focused field, the hotel/hospitality industry does relatively well, with 52% of US hotel employees stating management does a good job encouraging employees to have fun at work (the US overall comes in at a much lower 45%). Auto dealerships and non-profits fare about as well as hotels in terms of their "fun" factors with 51% and 52% respectively. Credit Unions have been as high as 57% in past years, but have dropped somewhat recently perhaps due to the turmoil within the financial industry as a whole. Coming out on top, though, are those working in the real estate sector with 63% reporting management encourages fun at work. Transportation comes in below average at 40%, while government workers manage only a dismal 27%. Ouch! Does this explain all those grumpy folks who work at the DMV? So how about your place of work? Is having fun in your job important to you? Does management crack the whip or crack jokes?